Orbit GT and Vexcel Imaging will be showcasing an integrated solution for Aerial Oblique and streetlevel Mobile Mapping data, operational within ArcOnline, at Esri IMF and UC, San Diego, July 8-13. 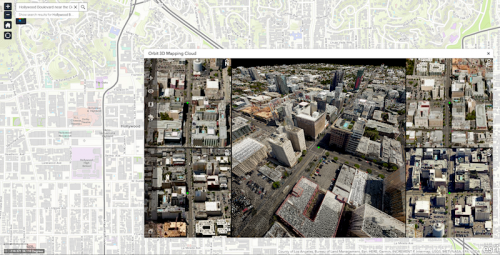 The showcase integrates over 3TB of aerial oblique and streetlevel data in ArcOnline. It includes viewing of 4 oblique images in sync, steaming 3D point clouds from oblique dense matching and streetlevel LiDAR combined, and thousands of high resolution spherical streetlevel images. Measurements can be made in any of the views or datasets and with equal ease and precision. Please join Vexcel Imaging on booth M200 at the Esri IMF, July 8-9, Manchester Grand Hyatt and booth 831 at the Esri UC, July 11-13, San Diego Convention Center. Please join Orbit GT on booth 1930 at the Esri UC, July 11-13, San Diego Convention Center.